Lobster is usually an expensive dinner entree. 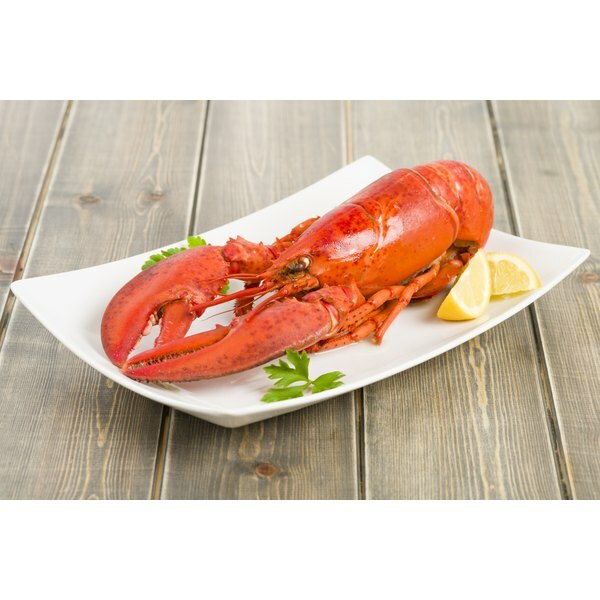 Lobster is considered a luxury ingredient, often reserved for special occasions due to its general high price. Although well-suited for a dinner party, the light flavor of the seafood can be easily overwhelmed. Serving light appetizers with mellow flavors helps ensure that your guests are able to savor the lobster later on. Keeping the appetizers light and healthy also means guests can indulge in a little butter sauce at dinner without going overboard on fat and calories for the night. Fresh melons are classic healthy appetizer ingredients, partially due to their fat-free nature and sweet flavor. Toss a light salad dressing into a bowl of mixed melon to enhance the flavor and give the dish a fancy touch. Try light herb vinaigrette dressing over mixed cantaloupe and honeydew melon balls or light raspberry vinaigrette over watermelon chunks. Sprinkle the melon balls with any fruit juice instead of dressing to boost the sweet melon flavor, such as lime juice for a tart taste or mango for a tropical twist. Serve the appetizers with toothpicks or spear a few pieces onto skewers for fruit kabobs. You don’t have to load potato skins with fatty toppings to create a tasty appetizer for a lobster dinner. Bake several large potatoes until the insides are soft and the skins are crispy. Cut the potatoes into quarters and scoop out most of the flesh. Sprinkle the skins with your favorite herb blend and mist with non-stick cooking spray. Cook the potatoes skins until golden. Serve the skins plain or with a low-fat dip. The skins are lower in fat and carbohydrates than most potato-skin appetizers, but still have an appealing crunch. Turn to cherry tomatoes and low-fat mozzarella cheese to create healthy appetizers with an Italian twist. Slice the cheese into small cubes and cut the tops from cherry tomatoes. Spear a cheese cube between two cherry tomatoes with a toothpick. Drizzle the mini-skewers with light Italian salad dressing or serve the dressing on the side. Sprinkle the skewers with fresh, chopped basil and parsley if you don’t care for oily salad dressing. Using fresh herbs instead of dressing cuts down on fat calories and provides flavorful nutrients as opposed to artificial flavors. Take advantage of a celery stick’s natural cup shape to create light appetizers for a seafood dinner party. Smear the sticks with a mixture of diced apple and low-fat cottage cheese for an ultra-healthy course, or smear each stick with a mix of strawberry jelly and low-fat cream cheese for a sweet appetizer. Stuff each celery stalk with crab salad for a creamy nibble or mild salsa for an appetizer with a little kick. Celery is high in water and low in calories, so the appetizers are only as healthy as what you use to stuff them.